Analysts Alphabulk have run the numbers on insolvent Giuseppe Bottiglieri Shipping (GBS) and shown how badly the Italian firm read the dry bulk market. GBS filed for court protection in Italy on December 29. Its fleet today stands at 11 bulkers and four MR product tankers. “GBS went on a buying spree nearly at the peak of the market,” Alphabulk related in its latest weekly report. The Italian owner bought six post-panamaxes in China in January 2007 at $45m per ship, plus two options. It then bought two more in September of the same year for $50m each. Worse still, in April 2008 – just months ahead of the dramatic bulk crash – it ordered a cape with a “lofty” $85m price tag, with an option for a second one. The option on the second capesize newbuilding was never exercised, but the two options on the post-panamax vessels were exercised, bringing the ordering tally to a total of 11 dry bulk vessels for a total price of $545m. 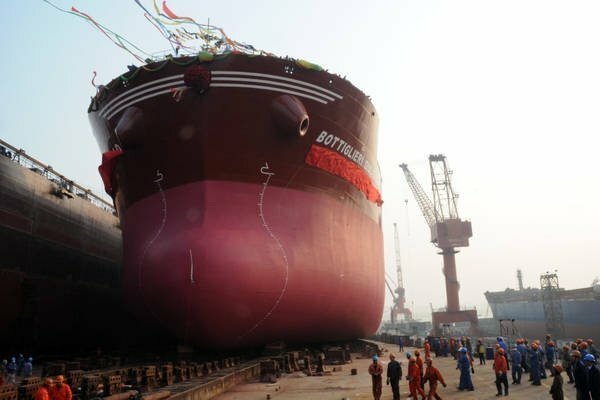 “With the typical leverage available at the time, this order could well have been financed with only $100m of equity, the rest being debt,” Alphabulk noted. GBS’s 11 ships today are worth just $140m, while it still has $340m of outstanding debt on the same ships, “the legacy of mistiming a huge programme of newbuildings”. At the time of filing, GBS’s negative equity stood at $160m. There is plenty more out there like this one. Herd mentality springs to mind. I thought it was mean’t to be ‘buy low sell high’ and not the other way around. The finance personnel and board members in shipping companies and most shipping bankers have certainly shown they are not worthy with their reckless borrowing and lending. It’s a vicious circle, the shipping bankers can sell a finance proposal to their board when freight rates (cash flow) are high, regardless of over valued purchase prices and ship owners as most know take a long term view basis future cash flow yield and were oblivious to how much the asset cost and where the value was at on the chart. Even after the crash there has still been the same owner mentality prevailing during 2012 to 2015 and those that entered many dry sectors are still down more than 50% on values.